As a general rule, I’m completely neutral about private-sector unions. As I argued in this interview, the federal government should not take sides or tilt the playing field when unions and management squabble. I have a more skeptical view of unionized bureaucrats, though, because politicians (acting as “management”) have no incentive to be frugal since they’re spending our money and there’s no competitive pressure to be efficient. Which is why this cartoon is the best summary of “negotiations” between politicians and union bosses, and this video is damning proof that bureaucrats are wildly over-compensated. 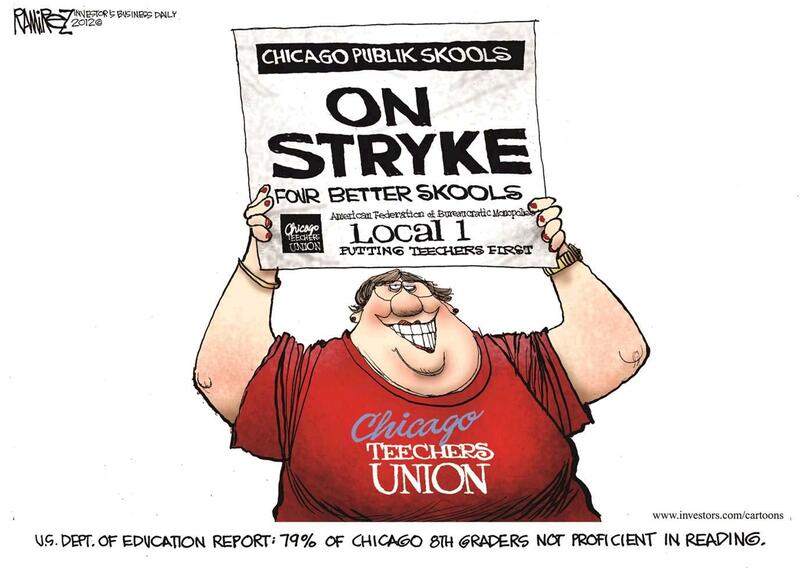 So it’s no surprise that I’m unsympathetic to the striking teachers in Chicago. They earn more money than the taxpayers of the city, yet they do a terrible job of educating students. Here are some good cartoons, beginning with a gem from Michael Ramirez. You can see some of my favorite Ramirez cartoons here, here, here, here, here, here, here, here, here, here, here, here, here, here, here, and here. Here’s another cartoon. 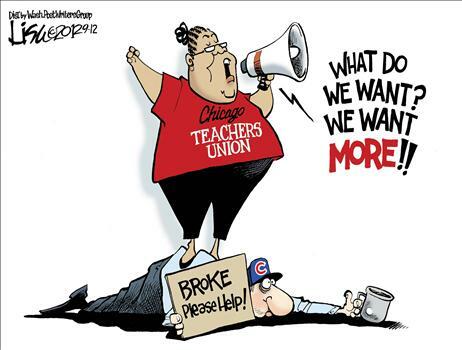 Instead of mocking teachers for doing a crummy job, it zings them for insatiable greed (similar to this cartoon). Lisa Benson did this cartoon, and you can review some of her best work here, here, here, here, here, here,here, here, here, and here. Last but not least, I’m not even sure what we’re supposed to learn from this cartoon. But it implies thuggish tactics in Chicago, so let’s add it to the list. Sort of reminds me of this cartoon about Wisconsin. The best outcome of the strike, by the way, is to junk the government education monopoly and implement a sweeping school choice program. Chile has reformed its education system with vouchers, as have Sweden and the Netherlands. 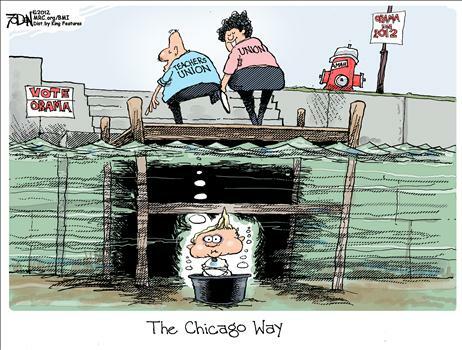 So why shouldn’t kids in Chicago get the same opportunity? The answer, of course, is that there’s a corrupt and symbiotic relationship between unions and local politicians. The kids are nothing more than collateral damage. Reblogged this on The Word from the Front. I do have a problem with private workers unions when they become entities bigger than the businesses they work against. I’m thinking of the UAW here. We have three big auto companies in the US and all of them have workers represented by the UAW, and now, two of those companies are quasi-governmental entities, GM and Chrysler. You can’t tell me that there won’t be any collusion on the part of the UAW acroos all three auto companies when they go on strike. To me, the UAW is just as much a monopoly as any other big monolithic business entity could be. However, I completely agree that public sector unions should never have been allowed.